We were not a couple who “always thought” we would adopt some day. Honestly, I am not a huge baby person. We had our 3 biological kids, and I was crazy about them, of course, but still never felt we needed to adopt. With Mohamed no longer with us, one evening in December 2006, my husband and I were out to dinner and he just plopped this question on the table – “So are we going to adopt or what?” That question just sat there, and we actually turned it over and over. This was definitely some sort of thought God had planted. 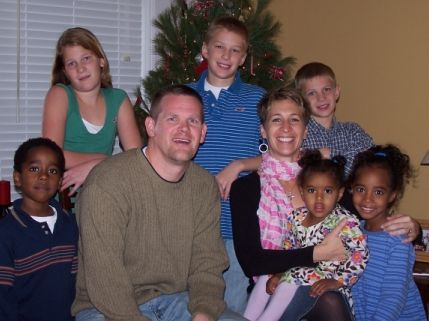 February 2007, we then looked into our state’s foster to adopt program. We left that first meeting a bit confused, as we both thought we would adopt domestically, but after the meeting, both felt inclined to pursue international adoption instead. My first desire was to adopt from somewhere in Africa, as a way to somehow be a part of Mohamed’s people, his land, but I didn’t share this desire with my husband. As we researched our options, however, then he and I both came to the decision together to pursue adopting from Ethiopia. We also were not sure what gender to adopt. We had 3 children, an 11 yr old boy, a 9 yr old girl and a 7 yr old boy. My daughter desperately wanted a sister, but I couldn’t shake my desire for another boy. My husband decided we should adopt one of each. And as I said, we are not baby people, so we decided on a boy/girl sibling set ages 3-7 years. Then, on February 27, 2008, we got referred our 4.5 year old twins. Their birth mother was sick and could no longer care for them. They also had a one year old sister at home, but the birth mother was not relinquishing her. TWINS!!! I had prayed the desire of my heart many times to the Lord, and prayed for twins, but also prayed for God’s best choice for our family. What a blessing, what a kind God. We got the twins on April 14, 2008. Then, bringing them back home, we started the massive adjusting. They were very ready for a mom and dad, and also connected so well with our bio kids. But this was still a very exhausting, stressful, difficult time. I knew this was God’s best for us, and was trusting for his strength daily, but I must admit it was hard. I had to die to myself daily, to my selfish desires to just go out and do the coffee thing, or the shopping thing that most of my other friends were doing, as their kids were all school age, like my bio kids, and were finally getting some free time. Four months after bringing the kids home, on August 14, 2008, we got a call from our agency that the twin’s mother had died, and their little sister was now an orphan. Would we consider adopting her? This was the HARDEST decision we have ever had to make. I was still hugely in the throes of adjusting to the twins, not feeling settled at all yet. Their little sister was less than 2 years old (remember, we ARE NOT baby people), the financial burden of adopting again, and parenting yet another child was also daunting. Farmboy and I prayed and sought the Lord through the Word continually. Honestly, we prayed that God would give us a firm NO. We did not want to do this, but did not feel at peace saying no unless this was from God. Finally after 4 weeks of seeking the Lord, we felt our hearts slowly change and we were miraculously ready to go forward with the adoption. We were planning on calling our agency the next day. Our agency, however, called us first to inform us of the difficult news that tests were just back and it was determined that their little sister was HIV +. Our first thought was, is this a closed door? Is this the “NO” we were praying for? So we prayed some more, both feeling really confused about what God was calling us to do. Then one day, after the kids all left for school, I just started to sob. I begged God for his guidance and advice. He seemed so silent. I then emailed our agency, informing our case worker that we were not going to pursue the adoption. I thought this would give me some peace, that since I had finally made a decision, we could move on. No peace came. That afternoon, as I paced around the house, I felt the only thing left to do was read the Bible. Maybe that would help me, calm me. I opened up to where I last left off. I read 2 Corinthians 8:10-12. "And here is my advice about what is best for you in this matter: Last year you were the first not only to give but also to have the desire to do so. Now finish the work, so that your eager willingness to do it may be matched by your completion of it, according to your means. For if the willingness is there, the gift is acceptable according to what one has, not according to what he does not have." These words pierced my heart, and I sensed a flicker of peace begin to grow, as I finally felt like I knew what God was asking us to do. I asked Farmboy to read that passage that evening, not at all wanting to persuade him. After he read it, he basically said, “Well, let’s go.” From then on, we were able to embrace this adoption as something God wanted us to do. I have learned that if God is orchestrating it, He will provide what is needed for every step, and that there is blessing throughout the journey. I certainly hoped that the paperchase and other adoption hurdles to jump for this next adoption would be relatively easy. But this was not to be. Once we started working on completing this adoption, there were obstacles and delays around nearly every corner. We initially thought we would bring our daughter home in 2008, maybe by Christmas that year. Instead, I finally got her Nov. 1, 2009. But, again, God is so wise. This was the best time to get her. First of all, she turned 3 on Oct. 13, 2009, and with us not being baby people, this felt like God showing us his sense of humor. He asked us to adopt her when she was only 1 year and 10 months, but he KNEW she was not coming into our family until she was 3 years old. He knew we aren’t baby people. He is so good. Since home, the adjusting has gone so much better than initially with the twins. Maybe it is because this isn’t our first adoption. Maybe it is because she is younger. Maybe it is because she is HIV+, and there is a part of me that feels more protective, nurturing because I know she is more vulnerable. Maybe it is because we only adopted one child this time. No, I believe this is just God’s blessing on me. I believe He is just being the awesome, personal, kind God He is. Praise Him!!! I ran across this quote recently and it totally resonates with me: "There is your plan for your life and God’s plan for your life, and yours doesn’t really count." That tiny little quote oozes truth. But it is not something to fear. Not at all. We just need to understand that God’s plans truly are best, and that He does love us deeply. Enough to die for us. How can we not trust Him? As I rock her to sleep for her naps, I have this welling up in my heart of love for her, and this deep knowledge that she was meant to be a part of our family from the very beginning. God had all three of these children planned for our family, and in His way, in His timing, He brought them to us and we all are blessed.